Dirty Dancing, The Classic Story On Stage, by Eleanor Bergstein hit Manchester's Palace Theatre last night, but it didn't just hit the board, it scored a bull's eye. I have seen various incarnations of this Musical over the years, but this one for me, has to be the definitive version. If the only 'fault' I can find with this production is that I could see the cast enter through a black curtain behind the set revealing the stage left wing, then director Frederico Bellone, his team and cast have done an absolutely sterling job! For those of you who don't know, this is a Musical based on the iconic dance-drama film of 1987, which starred Patrick Swayze and Jennifer Grey, two comparatively unknowns. The Musical follows the film story-line very closely, as Baby and her family are on holiday in a mountain holiday camp in 1963, and she meets the dance star of the hotel complex, a good-looking boy from the wrong neighbourhood. Of course they fall in love and with some plot twists along the way, they finally get together and delight us all with possibly the most famous dance routine of all time - including that lift - to the tune of '(I've Had) The Time Of My Life'. In tonight's performance two more relatively unknowns embodied the lead roles. Pity it wasn't a film, they would have been catapulted to immediate stardom. But this is live theatre however, and so recognition on such a scale is almost unheard of. However, Lewis Griffiths wasn't just dance star Johnny Castle, he totally embodied the role and his sexual tension was palpable. Whilst co-star Katie Eccles played with skill and ease the upper middle class white girl from the rich background, a little bored with her stymied life, Frances Baby Houseman. Other notable performances came from all the other cast members whether musicians, ensemble or named roles, it didn't matter. The quality of acting (some of the best acting in a Musical of this genre I have seen in a long while! ), singing and especially dancing was top notch. However, I will give a special mention to Micheal Kent as Billy Kostecki. His unerring broad smile made him a little geeky, and absolutely fitted perfectly to this role. His singing voice surprised not just me but the whole audience when his solo moment came and proved his falsetto and breath control were second to none! However, my favourite song in the whole show was a beautiful plaintive rendition of 'We Shall Overcome' followed by Sophia Mackay as Elizabeth singing an extemporised Gospel riff which was spine-chillingly poignant. It has also been a very long time since an entire audience was so absolutely together and in the final scene of Act 1, not a whisper, rustle or shuffle could be heard or seen, as everyone was simply glued to the stage, and the whoop and applause that signalled their approbation of the denouement to that scene was truly a unique experience, even for a thoroughly well-seasoned theatre-goer as myself. I highly recommend this production to young and old alike. It's a heart-warming tale, with a good message; and in this incarnation the story doesn't pull any punches; in fact, if anything, the music enhances the narrative, rather than the other way round. 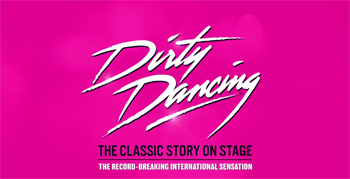 Dirty Dancing runs in Manchester until Saturday before continuing on tour.